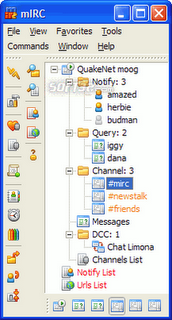 mIRC is a highly configurable IRC client with all the goodies other clients on UNIX, Macintosh and even Windows, combined with a nice and clean user interface. mIRC offers full color text lines, DCC File Send and Get capabilities, programmable aliases, a remote commands and events handler, place sensitive popup menu's, Switchbar, World Wide Web and sound support, and more. mIRC 6.31 has been released! TurboMilk mIRC is back with a new face! mIRC now has a shiny new mIRC logo and new interface icons, updated and designed by the good people at TurboMilk. To match the new icons, we also decided to redesign the mIRC website to bring it into the 21st century... we hope you like the new look! In addition to the visual changes in mIRC and the website, this new version of mIRC also addresses the various issues that were reported for the last release. For scripters, we hope you like the changes to the script editor. The interface has been improved, it is now cleaner and easier to read, we added Check Bracket/Sort Variables items to Edit menu, line numbers to the margin, and enter/home key indentation support. The editor also no longer flickers when resized. * Changed behaviour of "Hide minimized desktop windows" option so that query, message, and chat windows remain visible when they are first opened minimized on the desktop. In total there have been over 50 changes to this version and although most of them are only small fixes and tweaks, we hope that they result in a more useful and stable mIRC for you.